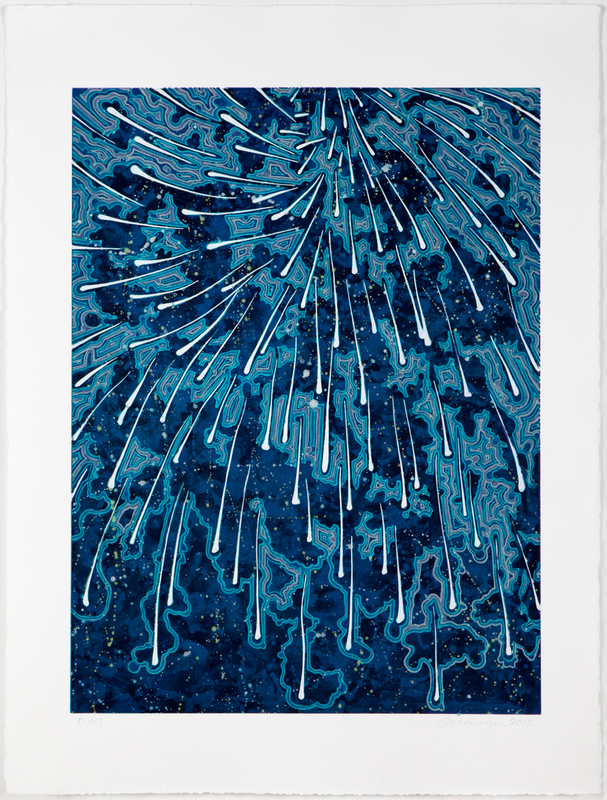 Wingate Studio is pleased to announce Falling (blue concentrate), a five-plate aquatint etching by Barbara Takenaga. During her second project with Wingate Studio created in Fall 2017, Takenaga explored territory relating to her newer body of work. The artist’s paintings have evolved from compositions of swirling dots emerging from a horizon line to looser crackling explosions over washy backgrounds. As Robert Kushner said in an interview with Takenaga in 2013, “Through the years your work has evolved and grown. Yet you always seem to retain a sense of Takenaga. No matter how experimental, they express your own unique vision. One of these aspects is your hybridization of abstraction and illusion.” Through this transformation the artist continues to be fascinated by the Big Bang, as is evidenced by her imagery. 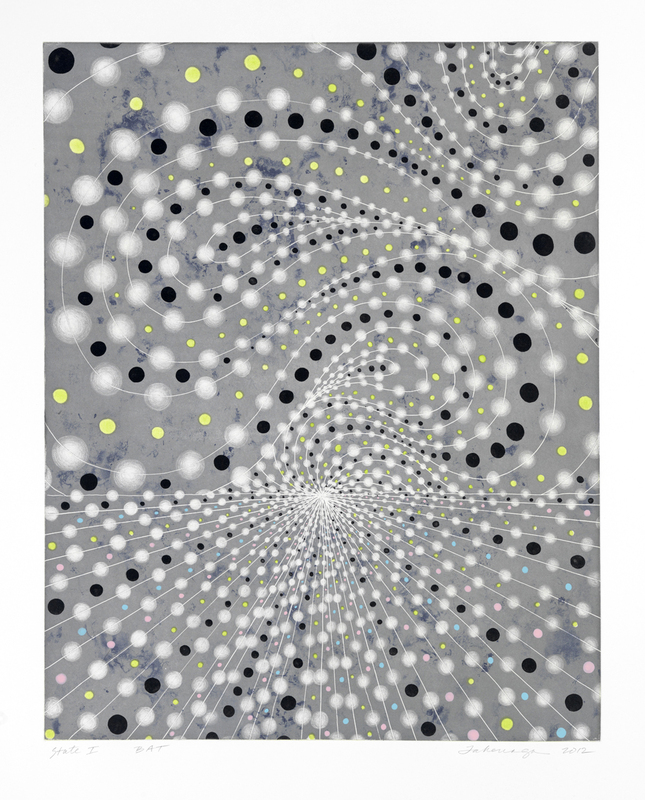 Barbara Takengaga (b North Platte, NB) is an American artist known for her cosmic abstract paintings and installations. She was the subject of a recent solo exhibition, a 20-year survey of her work, at the Williams College Museum of Art curated by Debra Bricker Balken and accompanied by a catalogue published by DelMonico Books-Prestel. She has forthcoming solo exhibitions at Robischon Gallery (Denver, CO) and DC Moore Gallery (New York, NY). Other recent solo exhibitions include Huntington Museum of Art (Huntington, WV), Neuberger Museum of Art (New York, NY), and Mass MoCA (North Adams, MA). Her work is in the collections of the DeCordova Museum, Smith College Museum of Art, Pennsylvania Academy of Fine Art, and Crocker Art Museum, among others. She is represented by DC Moore Gallery and Gregory Lind Gallery. 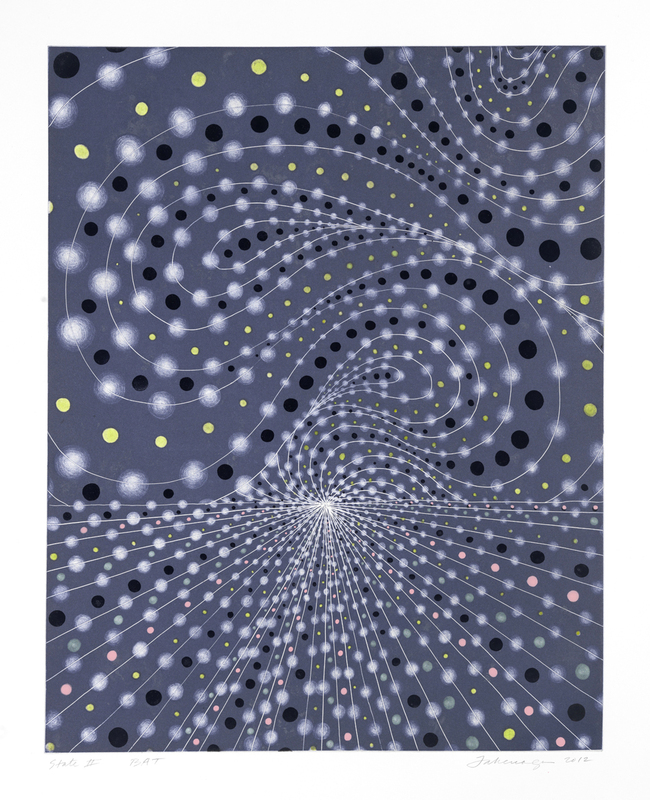 Takenaga lives and works in New York City and teaches at Williams College in Massachusetts.